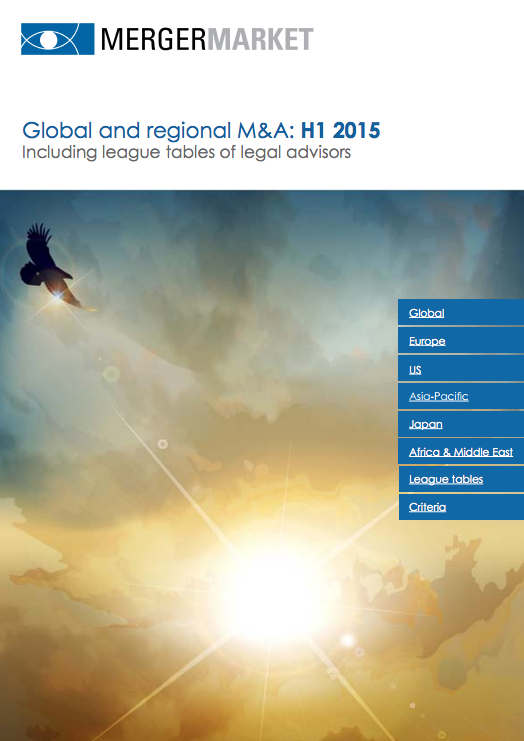 Confident management teams and shareholders in 2015 continue to rally M&A totals. The value of M&A announcements during H1 2015 increased 11.6% compared to the same period last year with US$ 1.70tn-worth of deals versus US$ 1.52tn this time last year, marking the highest half-year period since H1 2007 following Q2’s third consecutive quarterly increase. Shareholders are not only encouraging, they are expecting companies to use bold M&A for growth in 2015. The mega-deals (>US$10bn) phenomenon continued at an even greater pace in H1 2015 with 28 deals amounting to US$ 678.1bn, the highest value and deal count for any H1 period on Mergermarket record, and a giant 87.2% leap in value with twelve more announcements compared to H1 2014. A digitised world results in multiple industries needing to acquire companies that will provide new technologies, or those able to help build them so they can advance. Telecommunications, Industrial & Chemicals and Consumer firms are hot on the tail of Technology targets this year. As a result, Technology M&A is well on its way to reaching the highest annual value on record, with deals reaching US$ 198.3bn so far in 2015, just 10.7% from 2014’s record total (US$ 222.1bn). Please see here for the full report.